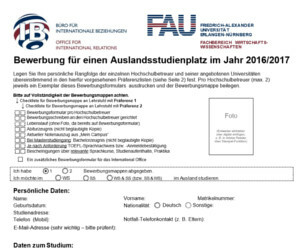 Our foreign students are invited to participate in ALL courses and seminars offered by our faculty, and also by the other faculties in Erlangen. At the beginning of the semester, the students should contact the professors whose lectures and seminars they want to attend. The basis on which credits are awarded for courses taken varies between final exams at the end of the semester and written papers. Unlike the lectures held by the professors, the seminars require the student’s active participation. Usually an essay (12 to 20 pages) has to be written on a certain topic, it then has to be presented and discussed with other students. Most of the lectures and seminars are held in German. So it is very important to establish a personal contact with the teacher. Don’t hesitate to introduce yourself – all international students are very welcome at our faculty!